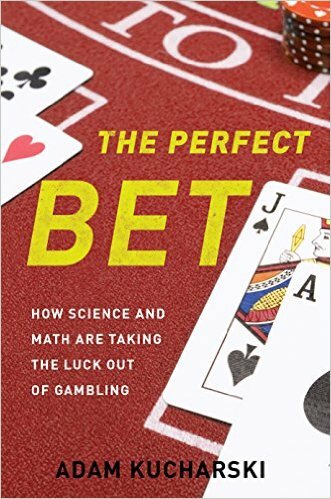 The Perfect Bet: How Science and Math Are Taking the Luck Out of Gambling by Adam Kucharski could well be titled, a brief history of advantage gambling. More specifically, how computers and game theory have revolutionized advantage gambling. In the 1500s there was a brilliant guy named Gerolamo Cardano who blew through all his inheritance. He decided he would become a professional gambler. What could go wrong? But he is the first guy we know of to analyze basic probability. He worked out the 36 combinations of two dice, and even worked out how to deal with multiple random events using "Cardano's Formula." He wrote the first book on probability in 1564, Book on Games of Chance, but it wasn't published until 100 years later. Zoom through the next 500 years, and we get a bit about Fermat, and Pascal, and the beginnings of game theory, and John von Neumann. But this is not a dry history text. Because we quickly get to the computer age, and Ed Thorpe inventing card counting, and then trying to beat roulette. We get the story of Packard and Farmer using hidden roulette computers in the Eudaemonic Pie. We get the story of Bill Benter revolutionizing horse race betting in Hong Kong with computer assisted wagering. The MIT students that crushed the Massachusetts lottery, and much more. Is it mostly a historical overview, or does it actually delve into some of the math involved? It does not get into the specifics of the math. Interesting stuff, I have to admit. I came across it looking for the lottery winning suggestions. I think math can work for gambling in general but not for lotteries in particular. I've been analyzing Australian lotto results to apply some math tips. Yet nothing worked for sure for me. Winning the lottery is just to one's luck!